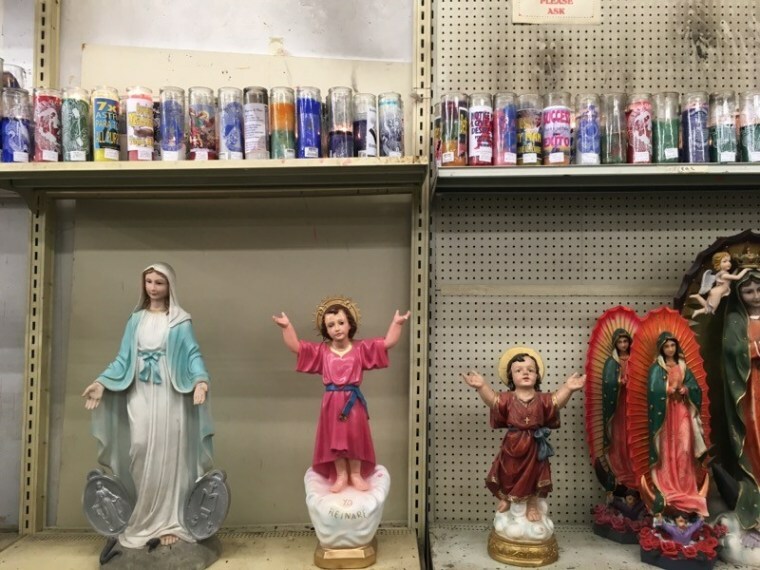 Originating in the Caribbean including Puerto Rico and Cuba, these shops specialize in selling folk remedies and religious icons, though amid the colorful votives and amulets you can find household items like detergent and toothpaste. While there are no official statistics on the number of botánicas in New York or across the U.S., botánicas are found in traditionally Latino enclaves like the Bronx but also in hipster neighborhoods that have gone through gentrification like Williamsburg, Brooklyn and Austin, Texas. Owned by a Dominican immigrant, Siete Arcángeles caters to those interested in Dominican Vudú, also referred to as 21 Division. According to employee Joshua Hernandez, 28, 21 Divisions evolved from the fusion of Catholic, indigenous (specifically the Taínos) and African worship. “African slaves who were brought to the Caribbean would syncretize their saints with Catholic saints that most resembled their spirits” he said. Further up the road, located on a bustling intersection in the Bronx, sits another botánica, Original Products Company. Opened in 1958 by Sephardic Jews who emigrated from Turkey, Original Products is an outlier in its line of business in that the industry is still largely run by Latinos. The retail store offers spiritual consultations, herbal remedies and a space where long-time customers can feel at home. The colorful orange storefront is warm and inviting. A makeshift shrine of Jesus and his disciples greets customers as they walk through the doors. A group of women talk among themselves in Spanish as they peruse the candle aisle. A customer consults with an employee, doubtful about the effectiveness of a charm necklace. Amid the cold and flu season, Martinez has seen a surge in sales of turmeric and Echinacea, herbs used to help ward of flu-like symptoms. Her customers are overwhelmingly first and second generation Latinos, but she has slowly seen more non-Latino whites and African-Americans entering the store. Martinez points out that many of the customers like the fact they sell herbs and plant-based teas they recognize. Maria, 42, a Cuban-American, heard that the Original Products selection of reasonably priced herbs were a bargain. “ I am going to give you half a pound of corn silk. Add boiling water and drink as a tea,” said Martinez to Maria. In New York's East Village, the San Elías Botánica Flowers specializes in tarot card readings for those wishing to see what the future might hold. Liz Mary Tejada, 25, is the shop owner of San Elías. She is the daughter of a Dominican mother and a Haitian father. Her parents emigrated to New York in the 1970s. Like many who came seeking better opportunities, Ms. Tejada’s parents came with little and worked their way up. They always had aspirations to own a business, so when the opportunity came they opened up a shop in 2007 while their daughter was in middle school. Even though a majority of Tejada’s clientele is Latino, she has seen a shift in her customers; more Asians, whites and African-Americans are now stopping in. “They come because life is getting harder, people look for something to help them,” she speculated.